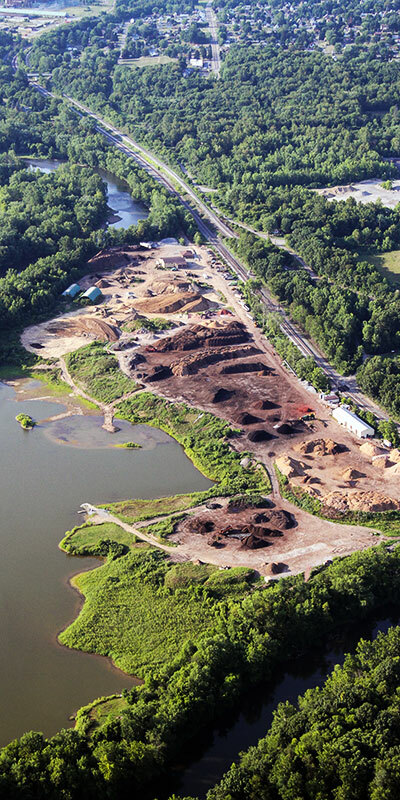 Company | S&S Processing, Inc.
Our mission is to produce landscape, athletic field, and custom engineered soil products. We provide consultation, installation and maintenance services of unparalleled quality. We strive for excellence in all that we do. We began in 1989 as a large scale mining company, producing some of the highest quality topsoil and topsoil based products in the region. Shortly thereafter, we expanded to include the production and distribution of hardwood bark mulches and dyed mulches. This is where our signature “Dark Double Grind” bark mulch was born. The subsequent development and success of our Fielder’s Choice™ infield mix line opened up a new era for the company. To meet the growing needs of the region’s athletic associations, school districts, colleges and professional sports complexes, we added a complete line of athletic field products, installation and consultation services. We expanded yet again in the mid 90’s and began providing engineered soils for specialized landscape projects throughout the Pittsburgh area. These soils ranged from utilization on rooftops (TerraRoof™) of various LEED designed buildings to bio-swale and bio-retention water basin areas to meet EPA requirements. Our excellence in this area has garnered us many unique and high profile contracts including Allegheny North Shore, Phipps Conservatory, Carnegie Mellon University, Pittsburgh Children’s Hospital, Allegheny County Office Building, and the FBI Building in Clarksburg, WV, to name a few. Now, after celebrating 25 years in business, we are honored to employ over 65 people in 5 different locations. Our fleet of over 30 delivery trucks distribute unmatched supply solutions to our customers on an hourly basis. Our number one priority is providing the best products with excellent service. Call (800) 237-7645 and we will deliver the quality and service that today’s market demands! To produce high quality landscape, athletic field, and custom engineered soil products. We provide consultation, installation and maintenance services of unparalleled quality. We strive for excellence in all that we do.